I was unsure where to put this, just move it if it doesn't fit here. 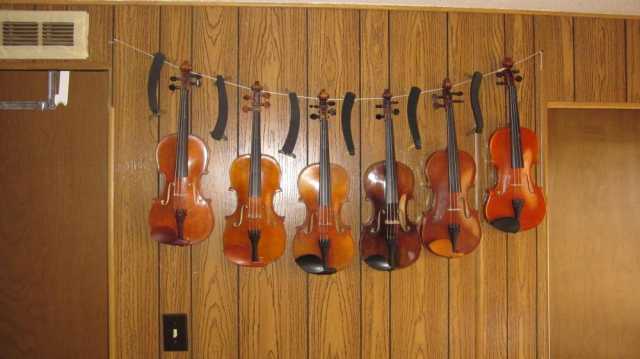 So I was thinking about violin hangers. Nice way to store the violin and its also decorative. But I got some sort of worries about them. Are violin hangers safe? The violin won't fall down unless someone bump into the violin or the wall, right? I have a lot of dogs and they have not been able to knock the violin from the hanger. 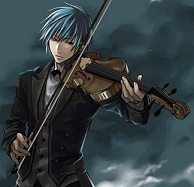 I don't leave my good violin in the path of the dogs but none have ever fallen. If the dogs haven't been able to knock it down, it should be safe in a calm house. I guess. Really cool Steve! I don't think you can get too many violins. lol. Could have been anything worse to collect. How do you store your bows? Do they have their own hangers as well? Hi Gry Hege, No I don't have special hangers for bows. I use two for my regular practice, alternating between them during a practice session. They hang on my cheap collapsible music stand that has a wire that can be extended out to the side (for holding pages down normally). The few other bows I have either stand upright in a corner or stay in the violin cases. I'm not a bow collector like I could be accused of being for violins. Nice collection Steve, I found it interesting that you have a shoulder rest for each violin as well, any particular reason? How are they being held on the nylon, just hanging on the arch? I used to keep my violins in their cases, and I liked to have a complete outfit ready to open the case and be playable without hunting for something, so I have a shoulder rest for each one. Also the same shoulder rest doesn't fit all the violins without readjusting; some take a wider or narrow adjustment of the rest. I've a other question. Sorry if I'm bothering you. Do you have anything on the backside of the violins to protect them and the wall? That is a SWEET collection there Steve. Makes it easy to grab one and get playing. I agree with scotty. I have a few guitars > they are always out of their case ready to play same with my viddle > Having it ready to go and not have to get it out of the case,etc might seem somewhat trivial but it does make practicing more consistent. Hi-- No, nothing on the back side between violin and wall. They don't move, hanging there, and it doesn't bother me. Fiddlerman, what hangers do you use at home? I was thinking I'd just go with the simple wall hanger but is it okay to have the "weight" on the pegs? It's fine to have weight on the pegs but they also rest on the curve between the neck and scroll.